Judge Martinez's role as a sports analyst for broadcasts of UM football games as early as 2003 is also described on the University of Miami Athletic Dept. website, sponsored by Coca-Cola. 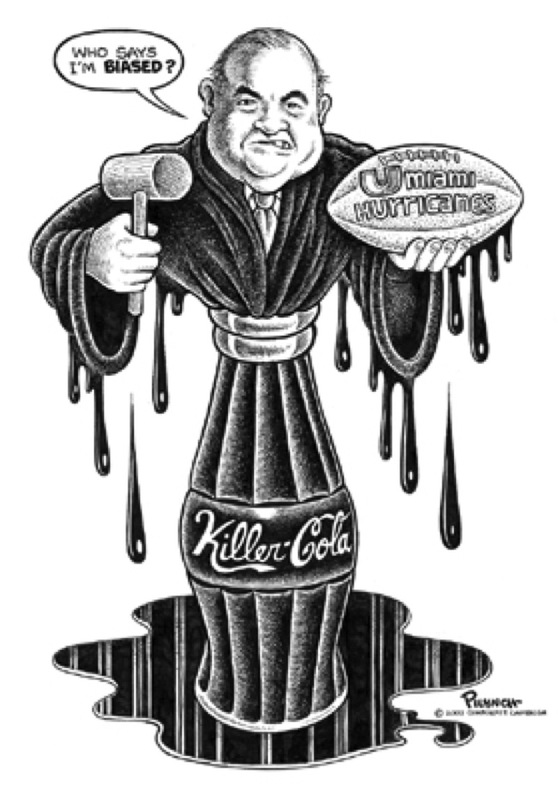 The University has had an exclusive beverage contract with Coca-Cola for years. Another ethics question came up last year when Martinez overturned a unanimous jury conviction against the Roman Catholic Archdiocese of Miami. The judge neglected to mention that he is a Eucharistic minister, playing a role in Catholic services at St. Augustine Catholic Church in Coral Gables. Fla. Judge Martinez was a name partner at the Martinez & Gutierrez law firm from 1991 until the time of his nomination, September 2002. Upon his appointment to the bench, the firm was renamed Gutierrez & Associates, but retained as its web address, http://www.martlaw.com , apparently referencing Martinez. The home page of Gutierrez & Associates highlights Jose Martinez's work as a partner, reflecting his importance to the firm. The Gutierrez & Associates list of representative clients includes such major corporations and governmental agencies as American Airlines; Borden, Inc.; California Insurance Commissioner; United States Tobacco International; Ford Motor Company; The Philip Morris Companies; Florida Department of Insurance; Emerson Electric Co.; BAC Florida Bank; US Education Finance Corporation; Terrabank, N.A. ; E.I. du Pont de Nemours & Company, and the government of Nicaragua. Martinez himself, while at Martinez and Gutierrez, represented the Tobacco Institute in a case before the Supreme Court. Gutierrez & Associates lists among its associated law firms a Bogota, Colombia firm, Gamboa, Chelela, Gamboa & Useche. That firm's website, in turn, identifies as a name partner Carlos Alberto Useche-Ponce de Leon, a former vice president of Coca-Cola de Colombia, S.A., who also serves as an "Advisor" to the Council of American Companies.